Thank you for visiting the official website of Windsor Park Dental. When you visit Winnipeg dentist Dr. Bobby Goldberg, Dr. Zachary Goldberg or Dr. Elena Ferrer your smile is the top priority. Windsor Park Dental is an established practice with skilled dentists who put the well-being of patients first. Our team is dedicated to helping you reach optimal oral health and maintain a healthy and beautiful smile. We believe that dentistry is about creating a positive connection with patients as well as delivering predictable dental care. If you are searching for a dentist in Winnipeg, we are located at 648 Elizabeth Road. Contact our practice today for a comprehensive evaluation and professional treatment recommendation. Our core services are designed to promote your oral health, while our cosmetic and restorative treatments (like porcelain veneers) completely transform your smile. If you have urgent dental care needs, we will do everything we can to stop your pain and get you back to your daily routine. If you have a serious toothache or experience a dental injury, contact us immediately. We provide instructions for temporary solutions and schedule you for treatment as soon as possible. Dental crowns can restore many problems, including cracks, discoloration, gaps, and crooked teeth. With our CEREC machine, you can have a new tooth designed and fitted on the same day. No more messy impression goop, and no more waiting weeks for your restorations to be fabricated by an outside lab. Our CEREC crowns look natural and are designed for a comfortable fit. Digital X-Rays and paperless charting allow for expedited and accurate diagnosis as well as services delivered conveniently. For additional comfort, all our operatories have ceiling mounted LED Televisions to help pass the time. We are here for every step of your oral health journey, from booking appointments and making financial arrangements to answering all your questions. Call us today and schedule a comprehensive consultation. NEW PATIENTS CLICK HERE, Call (204) 253-2691 or Request Appointment Online! After going to a terrible dentist for years, i'm so relieved to have found Dr.G! This man is amazing. His reception staff were patient & kind in dealing with me and my blue cross coverage. His hygenists (I had 2 different ones) were both lovely and took the time to answer the million questions I had about my root canal. The facility is very clean and overall a comfortable environment. Best of all is Dr. G... He is so smart and makes sure that his patient is well taken care of. He was not judgemental and didn't lecture me about why I had a cavity. For the first time in 25 years I actually look forward to going back to the dentist. I am a 64 year old male who thought his time in the dentist's chair was over. Unfortunately, this was not the case. A blister on my gum over my upper front tooth - which already had a root canal and a crown firmly in place for many years - indicated that there was a serious problem. X-rays revealed that the tooth was cracked to the end and that it needed to be extracted. Without going into great detail, suffice it to say that the only solution was to remove this crown and the three neighbouring ones and replace them all with a single bridge of four crowns. Major work! An appointment was set up. I dreaded the inevitable. However I didn't need to! Throughout the whole procedure, Dr. Goldberg and his staff made sure that I was comfortable - without even the slightest hint of any pain - and kept me informed as to what exactly was going on in my mouth. (I think I relaxed to the point of nodding off!) Now that the initial work is done, I am please to say that it looks fantastic! Dr. Goldberg has arranged for me to come in once a month for him to see that everything is healing properly. No other dentist that I've ever had has ever arranged for such follow-up. Dr. Goldberg's compassion, his knowledge and expertise, and his sense of professionalism make him a truly outstanding dentist. I am so glad I found him and do recommend him very highly. Very impressed with Dr. Goldberg's professionalism, demeanour and sensitivity to the patient's needs. I sought out(internet) the top dentist in Winnipeg because i was disgusted with work being done on 2 complicated teeth by a dentist who was more interested in collecting $$$ than helping me. Dr. Goldberg, in contrast was very sensitive to my needs and position and was very resourceful in saving a tooth. He was extremely warm and professional and kept me constantly informed about the procedures he was doing (unlike the prev. dentist who did procedures without my permission).Finally the best aspect was that Dr. Goldberg was able to do root canals and other procedures so i was not forced to go to 3 specialists to get the same work done. 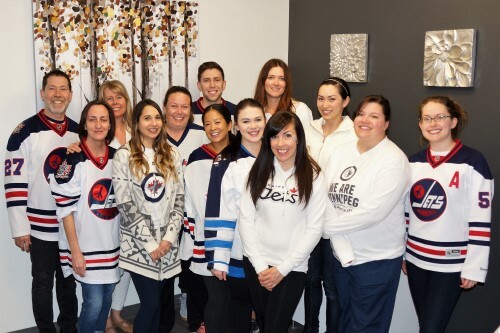 Winnipeg Dentists at Windsor Park Dental are dedicated to general dentistry such as Exams, Teeth Whitening, Veneers and more. We are looking forward to your visit to our Winnipeg, Manitoba dental office.